Finished statue and study by Sir Alfred Gilbert, R. A. 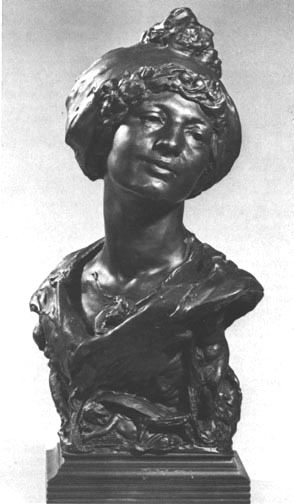 (1854-1934): Left: Eliza Millard Macloghlin (1906) Bronze on marble base. Height: 15 3/4 inches. Inscribed: "ELIZA MACLOGHLIN 190[?6] ALFRED GILBERT SCULP/ EHEU/FUGACES!" 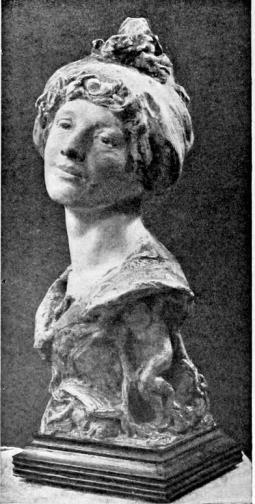 Right: Study for a Bust from the 1909 Studio. Gilbert modelled this portrait in 1906 at the height of his friendship with the attractive widow who had commissioned a memorial to her late husband. Six casts in all were made of which the present remained in the sitter's possession. The other five she gave to the Tate Gallery, London, The National Gallenes of Canada, Ireland and Victoria, and the Louvre. The present cast is accompanied by notes of thanks from Sir Charles Holroyd and Leonce Benedite for the gift to their respective institutions. The casting of these six heads was carried out by Albert Toft at the Wurttemberg Electro Plate Company; Toft then destroyed the plaster. As Richard Dorment relates the story of the relationship between Gilbert and his sitter, "Eliza Millard Macloghlin (1863-1928) met Gilbert in 1905 when she commissioned Mors Janua Vitae, her memorial to her husband. . . . When in May 1905 he and his wife legally separated, Mrs. Macloghlin stepped in, offering him adoration, encouragement, and companionship at a critical moment in his life. All who knew and wrote about her describe a compelling and vivacious woman whom they credit with delivering Gilbert from his despondency." Unfortunately, she was also "mentally unbalanced" and began to behave erratically, including writing a "deranged, pleading letter to Buckingham Palace. . . . Although she and Gilbert never met after 1908, when their love affair ended, and indeed, she spent her last years in a private mental hospital, she did not forget him. In April 1928. . . she returned all the sculptor's letters to him; on May 4 of that year she took her own life" (172). Alfred Gilbert. Exhibition catalogue. London: Royal Academy, 1986. No. 103. Dorment, Richard. Alfred Gilbert. New Haven and London: 1985. Pp. 249-59. Dorment, Richard. Victorian High Renaissance. Minneapolis: The Minneapolis Institute of Arts, 1978. No. 98b. Gibson to Gilbert: British Sculpture 1840-1914. Exhibition catalogue. London: The Fine Art Society, 1992. No. 37.